You may not know that Hog Roast Crowborough doesn’t just serve up gorgeous hog roasts, as our name suggests – we actually provide so much more for our customers and their invited guests and that includes various options for special diets as well as accommodating varying personal tastes. Whether you are thinking of a succulent hog roast or tasty spit-roasted meat for your party or event or something altogether different, like a barbecue, several courses of posh nosh or some alternative dishes for meat-free or gluten-free guests, we really do have something for everyone. Over the years, we’ve worked particularly hard to make sure that everyone is able to eat our food, which is made from fresh, quality ingredients, regardless of the dishes we serve. When Sally called to book us for a fancy dress theme birthday party recently, it was her first time hiring caterers. Having been recommended to us by a friend, Sally was excited to book us for one of our speciality hog roasts, which we would roast to perfection to then make pigs in buns for her and her 40 guests. Sally also asked us about our alternative options, as she wanted to make sure that all of her guests were catered, and that would include guests with dietary needs. Sally had invited a vegetarian, a vegan and two gluten-free guests, who all needed to be able to enjoy the food just as much as everyone else. With Hog Roast Crowborough, this is never a problem, as long as you let us know beforehand, like Sally did. 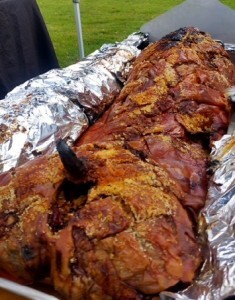 On the day of the party, Hog Roast Crowborough arrived at the venue several hours before food service as it takes a long time to slowly roast a hog until the insides are soft and juicy and the skin has turned into lovely crackling. Both the vegetarian and vegan guests would be enjoying our grilled vegetable skewers, and we had brought along gluten-free bread rolls so that the gluten-free guests could eat pigs in buns too. By 4pm, it was finally time to serve the hungry guests who had already started queuing up and many of them were already licking their lips in anticipation.